On August 16, 2013, over 250 waste recyclers of Safai Sena held a protest in front of Ghaziabad Nagar Nigam office (New Delhi region). Many of them marched over 12 kilometers despite heavy rains that day. 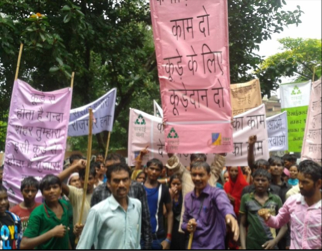 The protest was organized to raise a collective voice against the illegal collection of money by private contractors and exploitation of waste recyclers in Kavi Nagar and Mohan Nagar zones. Over 700 persons from Safai Sena have been working in the City, Kavi Nagar and Mohan Nagar zones of Ghaziabad for over 10 years now. Most of them pick waste from the doorsteps of over 18,000 households in Mohan Nagar and approximately 20,000 households in City and Kavi Nagar. Unfortunately, they are being forced to pay bribes by extortionists and over 500 waste pickers have had to pay Rs. 400 per month just to take the waste they have collected from households. Those who do not pay are beaten. Several women have been victims of this extortion racket run under the guise of waste management. This is unacceptable and against the Right to Life, which is also understood by the Supreme Court of India as the Right to a Livelihood. Apart from this, in Mohan Nagar, many waste pickers find it difficult to dispose of wet waste as no dustbins are provided for this. All these actions are in violation of the National Action Plan on Climate Change (2009) and the National Environment Policy (2006), which clearly mandate including waste pickers in solid waste management through institutional support and financial measures. The Plastic Waste (Management and Handling) Rules, 2011, also clearly state that waste recyclers must be deployed for plastic waste collection. The municipal commissioner has assured us that he would call a meeting and deliberate on the issues that have been brought up in the protest.